There are several different tunings commonly used for clawhammer banjo. 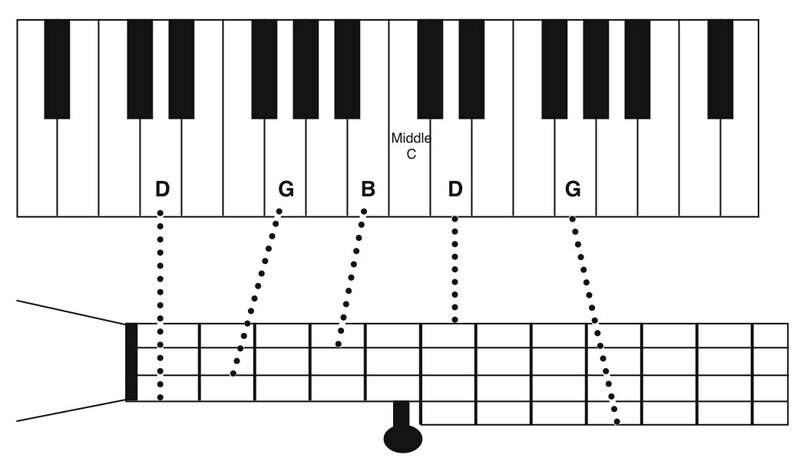 We are going to use the most common tuning called "G Tuning." If you already happen to play bluegrass style this is the tuning which is most often used so you may already be tuned up in G tuning. If you are new to the banjo let me explain a few things. First, in order to play clawhammer style banjo you need a 5 string banjo. I mention this because 4, 6 and 8 string banjos also exist! So, be sure yours has 5 strings before you continue. You really need a 5 string banjo to get that old clawhammer sound. To change the sound of any string (to tune it) means to twist the tuning peg one way or the other, tightening or loosening the string in tiny increments, until it sounds at a particular pitch. Tighter = higher in pitch, looser = lower sounding. Incidentally, the strings are numbered 1, 2, 3, 4 and 5. In this diagram the top string is the 1st and the bottom string is the short 5th string. To assist you in getting your banjo in G tuning here is an MP3 audio track which plays the sounds of each string. Feel free to save the file to your computer so you can listen to it without being online. Just match up the sounds of your strings to the sound of my banjo on the track. If method 1 or using the MP3 track doesn't work for you, (and don't feel bad, learning to tune well can take longer than learning to pick!) take your banjo to a local music store or to a musician friend and ask for some help. When you feel like your banjo is pretty close to being in tune congratulate yourself and move on to Lesson 2. (Pretty close IS close enough at this point. You'll sound better if you are in perfect tune, but you can still learn the basic picking motions regardless of the pitch of the strings. Your tuning will improve with time and practice exactly as your picking improves. Now, on to Lesson 2!